Corporate cultures that work through problems, not around them are more likely to achieve innovative, successful outcomes. Does your corporate culture inspire people to dig in and find new, creative solutions to problems? Going around problems is far too common in the corporate world. In almost every company, more attention should be placed on creating direct, simpler pathways to solutions. A recent client had 268 product offerings within one product line. This made life very confusing for their customers, as nobody inside could figure out how to simplify and prioritize. Life had become a shell game of politics and protecting territory (“my product is better than yours, and deserves more resources”). People were drowning in the details, and there was no attention left for the customer point of view. The solution? This company engaged a process to ruthlessly simplify their product line and streamline “go/no go” decisions about product launches and life cycles. This required developing a simple, one-sentence description of the strategy and goal (“Every product must be mobile-ready, return X profit margin, and compatible with our support team’s current processes, or be discontinued in 6 months”). It was painful but extremely freeing of people’s creativity. The conversations fostered greater alignment about the whole company strategy. Middle managers and front-line employees together, found simple, low-cost ways to save thousands of hours of frustrating work-arounds, and streamline sales and support efforts that were a drag on the bottom line. Establish an organizational culture that facilitates and encourages meaningful communication with hierarchical boundaries. Give people the chance to carve a direct path to success. 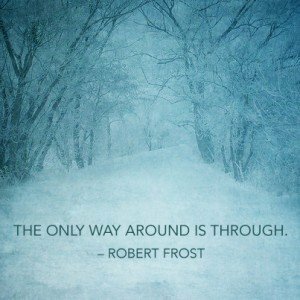 Open up the “through” path and stop beating around the bush with work-arounds!